This is quite a refreshing story, found in the British Library collection “Serpents in Eden”, featuring mysteries of the countryside – which turns out to be quite a tenuous link in fact, but never mind. At least I get to read interesting stories like this one. This story is quite unusual, in that although the crime is solved, justice isn’t done – pretty revolutionary for a Golden Age detective story, I can tell you. The bad guys escape to fight another day, although the detective (Mr Trent in this story) now knows what he’s up against and will be better prepared next time. Although I must say that when it comes to preparation, very little can beat this crew of reprobates. My word, they are thorough. 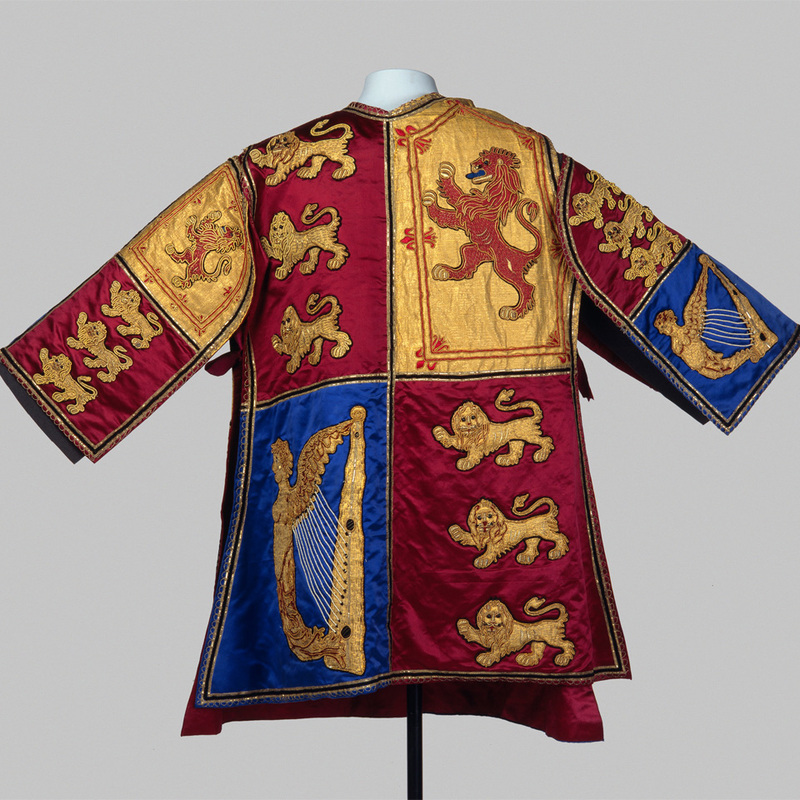 We see the action through the victim’s eyes – always a good move – as the triumphant story of how a heraldic tabard worn by the man who had to declare the independence of the United States on the steps of St James’ Palace came to be purchased by a collector from a rural vicar with an interest in antiquities. Which would be fine, if that’s genuinely what it was – but at best it’s been misrepresented and at worst, it’s stolen goods. Either way, the new owner not only has to part with his treasured possession, but he’s short of about twenty thousand pounds as well. That’s a lot of money for a top, even these days. It seems that a gang of thieves who specialise in antiques and rare objects – such as books, silverware – have taken a temporary let of a vicarage while the incumbent is on a pilgrimage, and used that as a front to sell their wares to unsuspecting tourists, who are encouraged to visit by their accomplice, posing as a knowledgeable man about town. Nobody would accuse a vicar of being dishonest would they? So when the vicar says it’s this, he’s immediately believed. Immensely clever. Sadly, by the time Trent has worked out what they’ve done, the original vicar has returned and the crooks have disappeared. It’s a clever story and very well written – but there is a class issue featured. All vicars have degrees (even these days) and this particular one was a fellow at All Souls. There’s an assumption that readers would have been aware that All Souls was, at that time, a graduate college and so would not have had sporting blues. I don’t think this was common knowledge, but it does show some authorial bias towards the readership Bentley thought he had. Whether this is a fair comment, I don’t know, but it did jar with me, and I like to think I know enough Oxbridge graduates to have got my brain round this idea. Jane Grigson wrote in her Vegetables cookery book that beetroot was the preference of people who liked their food dyed in medieval colours. Harsh, but there’s no escaping the fact that beetroot juice does stain everything fairly permanently, which is why it’s been used as a cloth dye for centuries. People forget, though, that there’s more than one shade of beetroot. Golden beetroot is a beautiful deep shade of yellow – even though it tastes exactly like its purple cousin – and I wouldn’t be surprised if it dyed everything a wonderful saffron colour. I’d quite fancy that in a risotto with some butternut squash, thinking about it. There’s also a wonderful rainbow beetroot, of which I’ve only ever seen photographs. I have no idea what this dyes things – I expect if you’re really lucky your teatowels will end up looking like Joseph’s Amazing Technicolour Dreamcoat, but somehow I doubt it. As you can probably tell, I do like my beetroot, but I’m not sure I like it enough to justify using it as a motif for a bedcover. 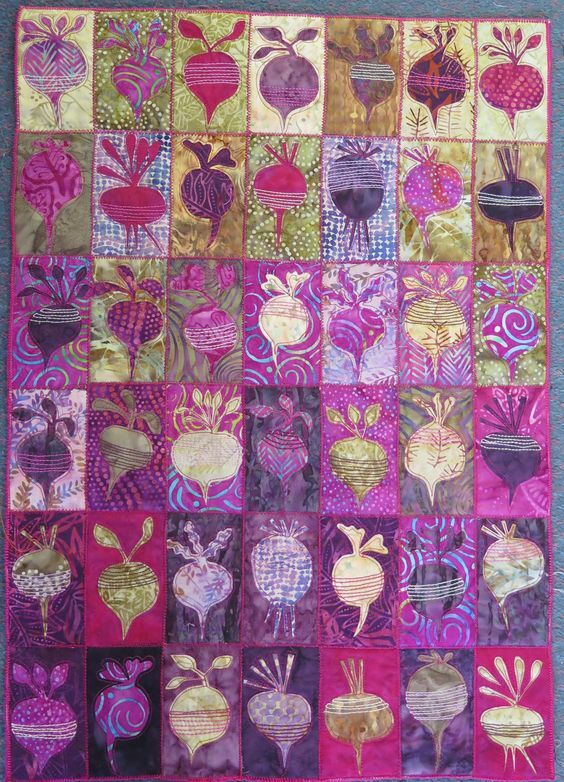 I’m finding it rather difficult to imagine what would possess a person to focus on a vegetable for a quilt. It strikes me as a bit bizarre, but it does look lovely and warm, and that’s the most important thing. I think I’d still rather have a beetroot stew in the winter though. Occasionally when I’m reading I find myself playing Casting Director and trying to work out who I would have portraying the characters if the story was ever filmed. I don’t do it often, but I did while reading this. I just had a vision of Tom Hiddleston and Julia McKenzie in the two leading roles that simply wouldn’t go away. Some of my friends would suggest that I need very little reason to have visions of Tom Hiddleston, and they would be right, but he really is perfect for the part of Harry. Essentially, the story is simple. A middle aged spinster is taken advantage of by a canny young man on the make, and when she has a heart attack he takes over her life. There’s more to it than that, but it would ruin the story if I went into every last detail. You’d have to read it yourself to appreciate the sense of growing menace that works its way through the story. I have to admit that I think this would make a great afternoon drama on the BBC. Do you think they’d take up the suggestion? You’d think with the amount of comics and graphic novels I’ve got through over a lifetime, I’d have written one by now. Sadly this is not the case. This is partly due to the fact that I can’t draw but mainly because I haven’t got the first idea on how to approach the subject. Would I have a superhero or not? Would it be a one-off graphic novel, like Watchmen or V for Vendetta, or a series, such as The Sandman? And most importantly – what would I do for a plot? I’ve had a few ideas for superheroes over the years, one of my favourites being a girl who is actually a dragon, and can switch between the two. She can also turn herself into stone (and back again) if she needs to. I can picture her being a fairly obscure member of the Avengers Initiative, if they ever needed a creature that could fly and breathe fire; perhaps when Tony Stark retires. 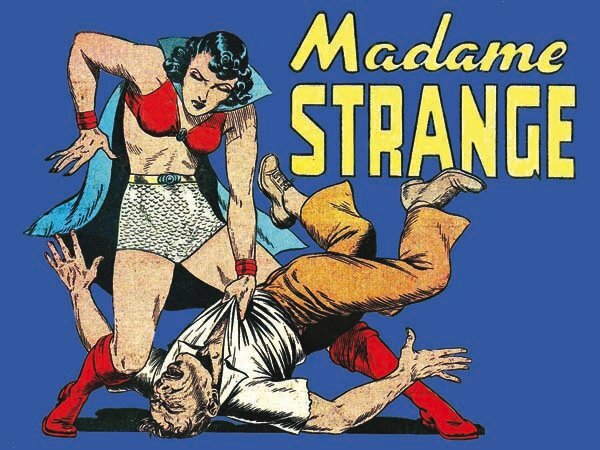 Another one I liked was a woman who was effectively immortal and had to keep switching locations and identities every ten years or so to stop people becoming suspicious of her. Admittedly, this is very probably influenced by Anne Rice’s Interview with a Vampire, but the telling difference between us is that my character was, generally speaking, human. All of this said, I’m actually finding it very hard to find a character who is (a) likeable, (b) interesting enough to carry a story over six “episodes”, (c) hasn’t really been done before – or at least, not the way I’m planning to do it. It’s here where I look back over some of my favourite comics/graphic novels and realise just how American they are. I feel obliged to point out that Captain Britain wasn’t unique in being a non-American superhero, but let’s face it, the poor chap’s in the minority here. Batman, Superman, the Fantastic Four, the X-Men, the Avengers – the overwhelming majority are American or have a US setting. That’s not what I want to write about. I need a new superhero. Looks like I’m going to have to put her together, though. Is it too late to learn how to draw at my age? 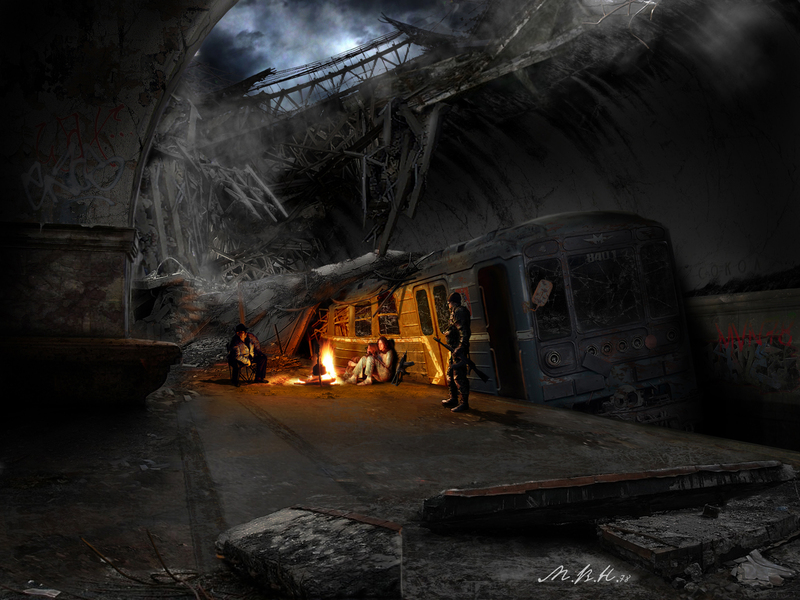 I’ve been reading a fair bit of post-apocalyptic fiction lately. I’ve said before that I like a good disaster movie and a decent disaster novel is no exception. I think they stand as a testament to the power of the human spirit that no matter what kind of disaster is faced, there are always survivors – well, that and the fact that without at least a couple of survivors, the plots would be pretty thin. The book I’m reading at the moment, Metro 2034 by Dmitry Glukhovsky, is set in the Moscow Metro twenty years after a disagreement between superpowers turned nuclear and annihilated – or mutated beyond recognition – anything above ground. It’s worth noting that the Russian Metro system doubled as a nuclear bunker, so it could be sealed off in the event of a nuclear attack. For a novel written in 2009, it’s got an alarmingly Cold War feel to it – let alone being utterly plausible in its reasoning. Anyway, this got me thinking. How would humanity survive if the world really did end? Naturally, the answer would depend entirely on the kind of disaster that befalls the planet- I expect an asteroid strike would pretty much obliterate the very ground we walk on – but there are a few ideas that seem to recur more often than others. During the 1950s and 1960s, unsurprisingly one of the most common backgrounds to apocalypse was a nuclear war. This surfaced again briefly during the 1980s before the collapse of the Berlin Wall caused the Cold War to start thawing. Some people – presumably the very rich or intellectually important – would emerge from their bunkers into a scorched wasteland and start to rebuild the society they had lost along idealistic lines. Inevitably, however, some people had would have survived the massive doses of radiation, nuclear winter and acid rain to cause trouble for the boffins and drama ensues. A variation of this is an Armageddon caused or manipulated by aliens – John Wyndham was especially good at this, to the point where his novels were termed “cosy catastrophes” by Brian Aldiss. I can honestly say that they certainly weren’t stressful reads. In later years, the trend for wiping out the human population turned towards disease, either through genetically modified viruses released by accident or design, or by a previously unknown or forgotten plague striking humanity. No disease being 100% fatal – although some come pretty close – there will always be survivors or people who are naturally immune (or just don’t catch it) – but will they be the same? Offshoots of this idea lead to vampires or zombies; indeed, this is exactly how World War Z starts, with Patient Zero being found in China and the zombie plague spreading exponentially. Society rapidly divides into the “infected” and the “clean” and the battle for survival commences. Less common is the climate change disaster, although more writers are looking at the implications of this as a basis for a thumping good dystopia. One of the earliest that I can recall is JG Ballard’s The Drowned World, but in recent years the idea has been revisited by films like The Day After Tomorrow or the novels of Paolo Bacigalupi. With climate change, there is always the argument that humanity may be able to adapt to a rising temperature and sea levels so some form of civilisation may continue. What it would look like is anyone’s guess, but it would exist. The drama comes from change that is sudden and far-reaching, not allowing humanity time to adjust. You can add to this list everything from global power failure due to solar flares, the moon leaving its orbit (changing the tides and possibly the seasons) to fundamentalist Christianity turning out to be right and the godly all disappearing in the Rapture. While people can think of a global disaster to wipe out the populace, they can usually think of a way it might be survived if we put our minds to it. Let’s just hope that these global disasters remain works of fiction, shall we? What Colour is the Frock? Fear not, dear reader, as a little research and a decent dictionary have solved this little conundrum and in so doing has offered an insight into how the English language evolves over time. At the time he was writing “Copper Beeches”, Conan Doyle – and his readers – would have known that beige wasn’t a colour at all. 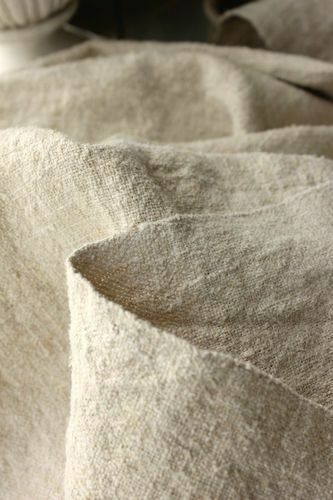 It was a fine woollen cloth sold undyed and unbleached for dressmaking and manufacture. As it was such a fine cloth, it was also quite expensive, and over time, people who couldn’t afford it would often ask for a cheaper cloth “the colour of beige”. Unsurprisingly, over time “beige” became better known as a bland neutral colour and completely forgotten as the fine cloth it was originally. So it is quite possible for the dress in this story to be both beige and blue – just as long as we remember that in the late 19th century, beige wasn’t what we think it is now. Here’s something to think about next time you’re in the bath (it’s where I do all my best thinking) – we know more about the surface of Mars than we do about the depths of the oceans on our own planet. Unbelievable, isn’t it? All the technology available to us, allowing us to put probes on other planets or on comets travelling through space at thousands of miles an hour, and we still can’t find out what’s at the deepest points of our own planet. Obviously, the pressures of the water at depths approaching two or three miles are immense – roughly five tons per square inch (compared to roughly fifteen pounds per square inch at sea level); but if we have the technology to defeat atmospheric pressure and gravity in a way that can send an object into space, surely we can think about exploring the oceans? The reason why I mention all of this is because I’m reading John Wyndham, a master of the short science fiction story that manages to terrify in its utter plausibility. 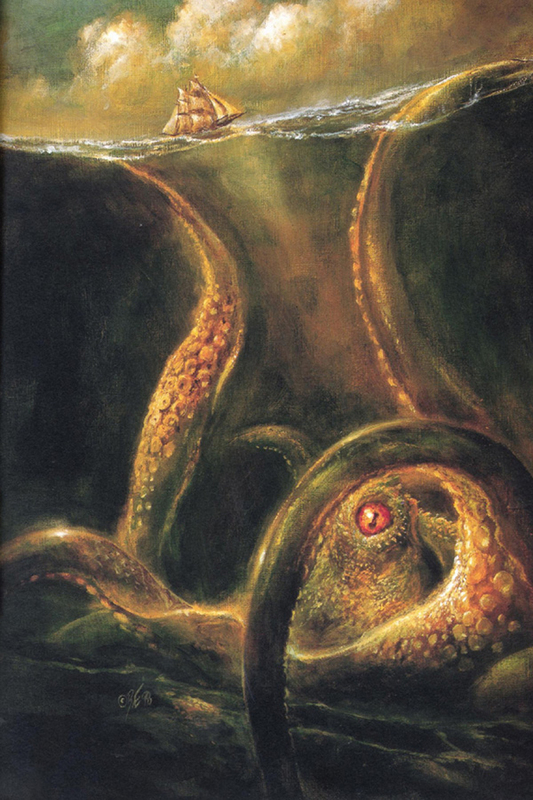 The Kraken Wakes isn’t one of his best known works, but he uses our lack of knowledge about the ocean depths to create an alien invasion story where the aliens take over and use the seas against us. Unlike the greatest alien invasion story of all (in my opinion), HG Wells’ War of the Worlds, there is very little fanfare and the action takes time – years pass in the course of sixty pages or so, as the aliens consolidate their invasion force and start to colonise the deeps. I think it is this passage of time that makes it all seem so realistic; it’s as if the invasion has sneaked up on us without our knowing. If there is a problem with the story, it is the distinctly Cold War mindset in the opening pages. That tends to date novels somewhat, but given how global politics shift one way and then back again, perhaps the insight it offers remains valid – countries would start off by blaming each other before realising that the threat is perhaps much more serious and a united front would be better. By which time, of course, it is much too late. I’d forgotten how much I liked John Wyndham; I’d also forgotten how much I love the mysteries of the deep ocean, and classic science fiction. Perhaps I need to read more.